I think that you are looking at a piece of machine made mesh that was patched into the piece. Here is a photo where the machine made mesh is outlined in red, the handmade in green and in between you can see that they were overlapped. Yes, I think you are correct that when the motifs were small they applied them, because it was too much trouble to sew them in, whereas with larger motifs it might have been more time efficient to sew them in. . It is quite likely that both techniques are to be found in the same piece in some instances. It is a mesh made with 2 threads instead of the usual 4. From a practical standpoint whether the motifs have droschel ground attached to their edges, or whether the ground covers the entire back of the motifs (applique) would depend on the relative size of the motifs. If the motifs are large, then hooking the droschel ground net threads into the motif edge would save work. But if the motifs are small then letting the net cover the entire back of the motifs would be faster. Doing sewings takes time. Its a question of which method is faster. I'm still a little fuzzy on exactly when machine made nets were widely available, and reliably available. My impression is that would be the 1820s or 1830s. Your Charles X piece might fit in the machine net era. But the others, probably not. So assume hand work. Yesterday, I realized after going through my photography, thee the making of the drochel ground in strips in Point d'Angleterre, or Brussels vrai drochel edgings is the norm, although I had never noticed it before. 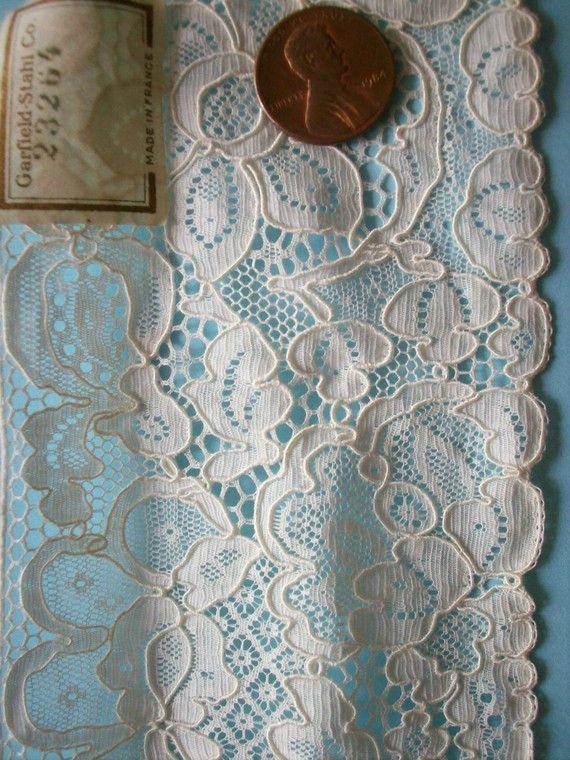 Subsequently, I heard from a well regarded lace authority who has a great deal of knowledge.She asked me whether I had ever seen a piece that was strips joined together with the motifs applied (as I had thought was the norm.) She also suggested that if the process was applique, perhaps the underlying mesh was actually machine made. In this last one the strips are really obvious. And the lacemaker seems to have taken just one pair and made a large loop for the next strip to be sewn into. And that is where the threads are breaking or frayed. Not enough support. Regarding the Point d'Angleterre with the strips of droschel. New theory. They are all like that but I never noticed before. See the photos for the pattern of joins. Lorelei, some of those little snowflakes look just like the filling in one of the photos. Interesting. One thing about using a pair as a single is that you can have more threads to feed into the linen stitch faster as in the Flemish laces. Your 2nd piece is also interesting. 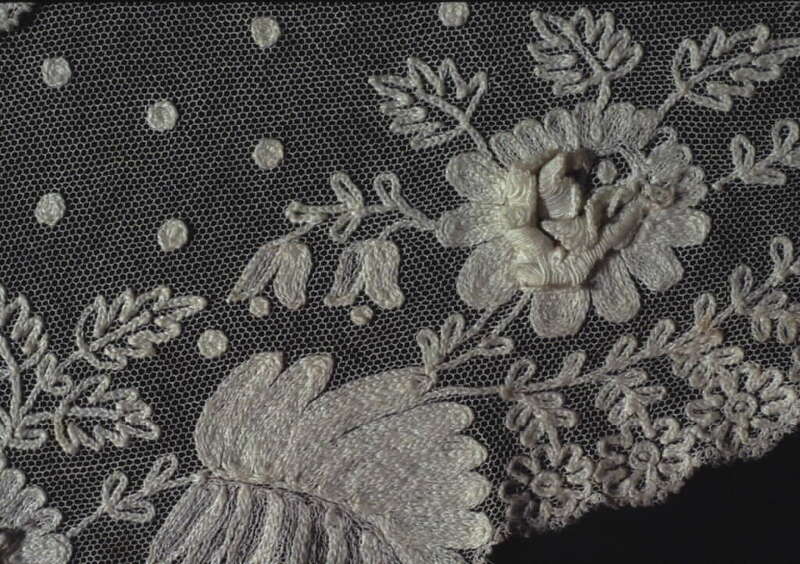 The raised work indicates that this is primarily a part lace, Duchesse or Brussels. 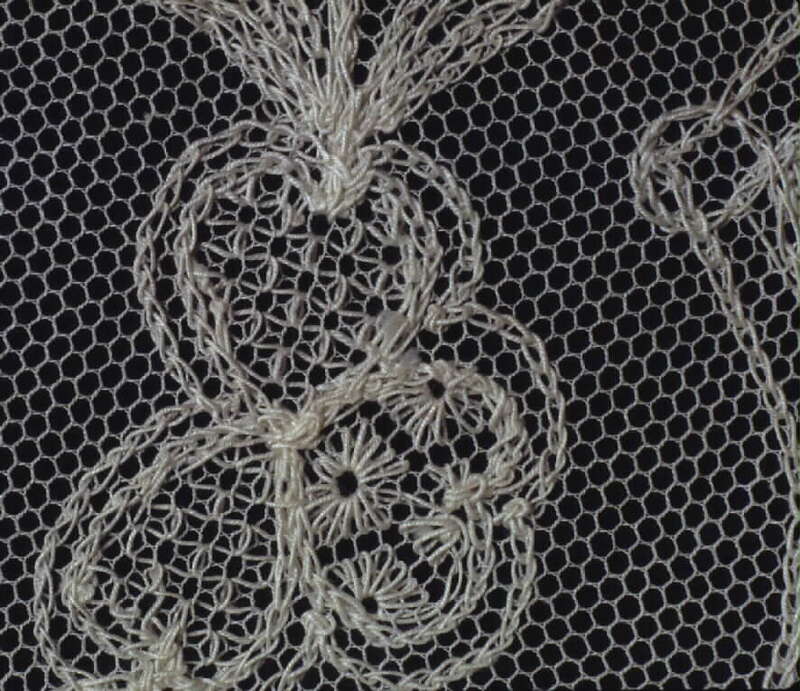 Duchesse, last half of the 19th century would almost certainly have had the motifs appliqued onto machine made net, I am not certain that machine net could be made in Droschel ground, or whether only point ground was possible. This is definitely Droschel ground. The existence of strips does seem apparent, which indicates hand made ground. 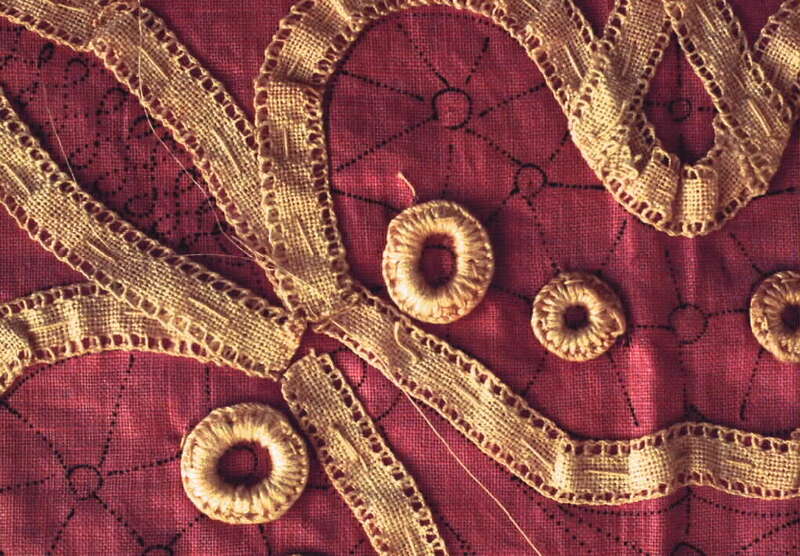 If hand made it would be possible to hook the ground threads onto the completed motifs, and to hook those threads onto motifs to start a ground section, and to complete one. So these technical elements suggest not last half of 19th century, but earlier. 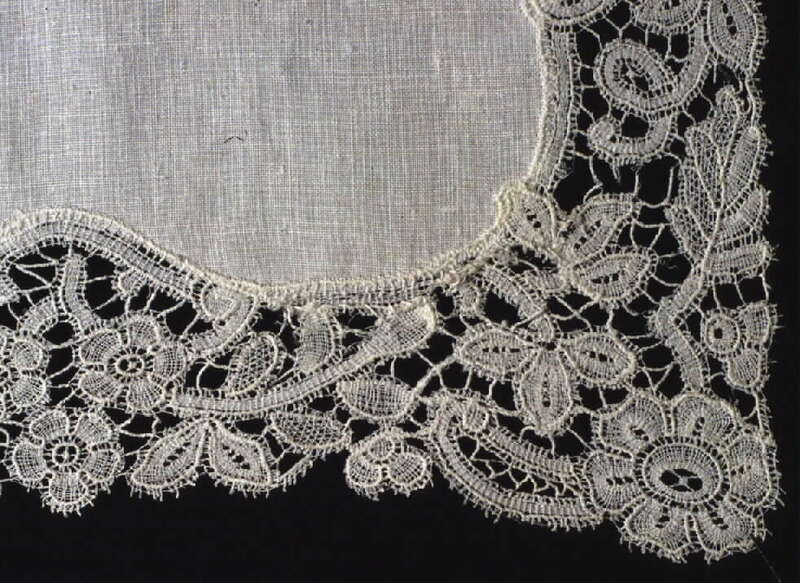 An odd element is that some of the edge motifs are filled with needlelace stitches, not bobbin fillings (although most have bobbin fillings). The design has a large ground-motif ratio. That was typical of the last 3rd of the 18th century. Both edges have motifs, not a straight sewing edge. So this was probably intended as lappets. How far into the 19 th century were lappets in fashion? They are definitely 18th century. I don't know enough about fashion history to pick an end date for lappets. 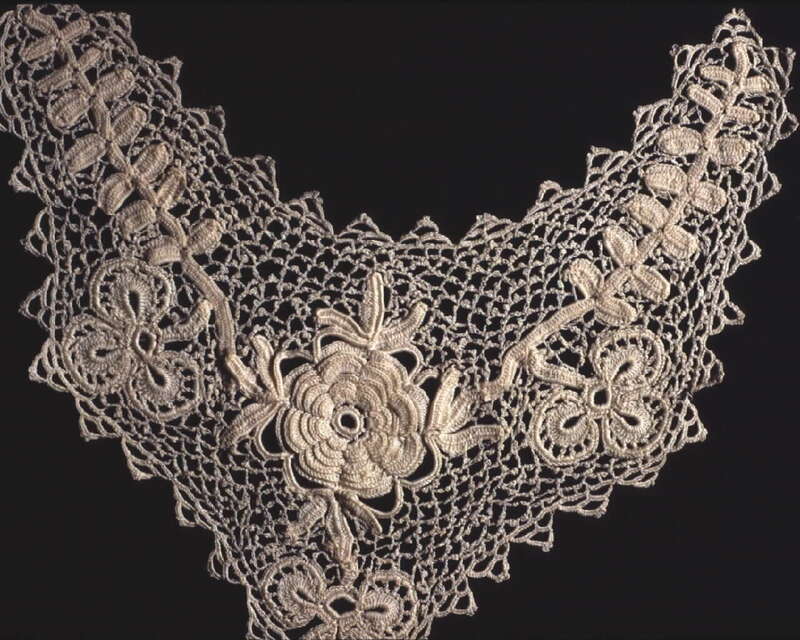 I seen to remember seeing a photo of Queen Victoria wearing a lappet type thing, but the lace was narrow, like an edging or insertion adapted for that purpose. But I'm not certain about this. On the whole, I think an 18th century date, specifically last half or last 3rd of the 18th century fits with the technical and design elements we can see. Devon - Here is Mechlin ground, oriented vertically, in the direction the lace maker would see it. It is a stack of half stitches, basically a Brussels ground without the pin in the middle of the stack. 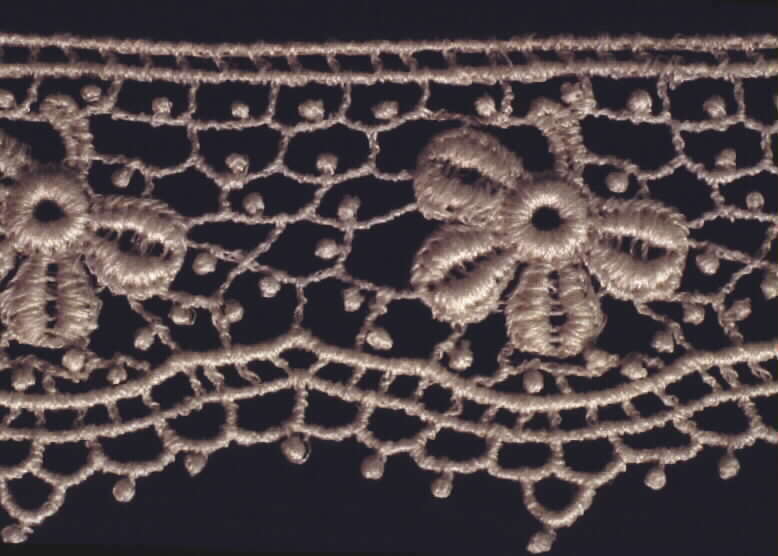 Here are some variations on the little snowflake, used in Binche, Flanders and other continental laces as a filling. As to whether it is Russian ........ I wouldn't venture a guess. 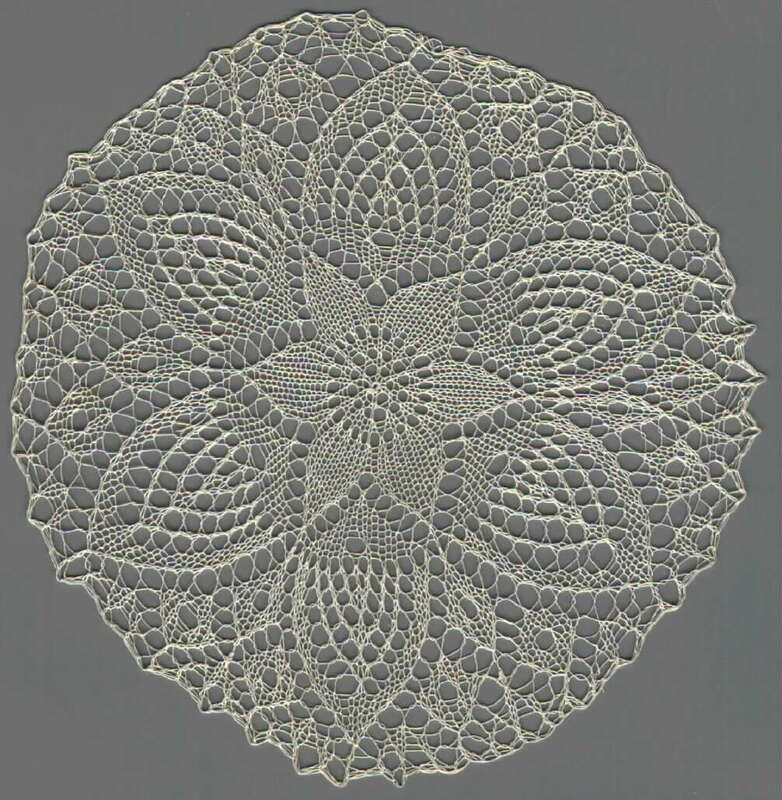 But point ground lace was made in Russian, and in every other lace making country, during the 19th century. The book is RUSSIAN EMBROIDERY AND LACE by Yefimova and Belogorskya, Thames and Hudson, 1982, with a foreward by Santina Levey. Most of the lace is Vologda and tape laces, but there are some point ground. The only distinction that I can see is a certain mechanical character to the design, lacking the flowing delicacy of English and Danish point ground. 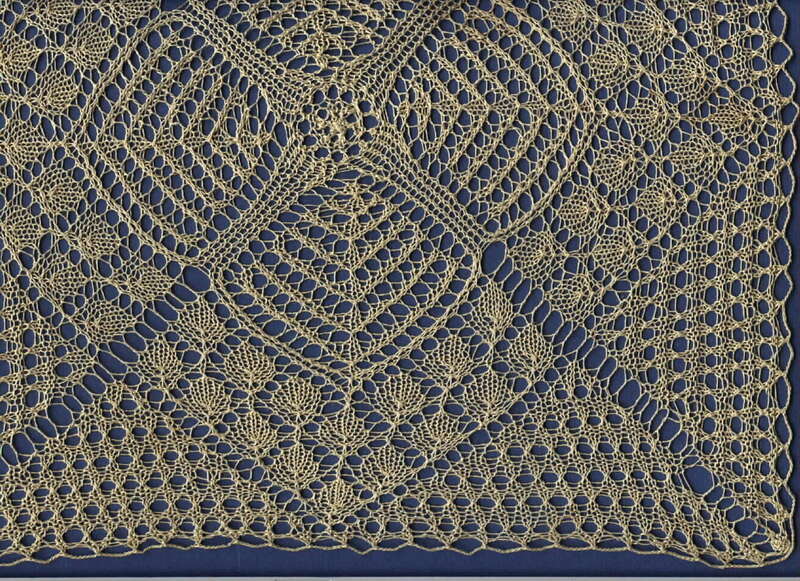 There is a booklet published by OIDFA, POINT GROUND LACE, A COMPARATIVE STUDY, 2001. 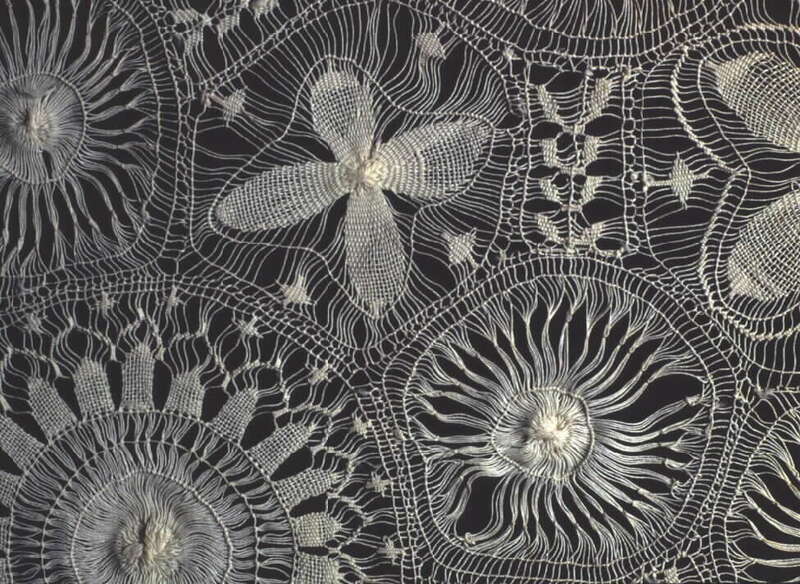 It purports to detail the itty bitty technical differences in stitches used, thread paths, in the various regions that produced point ground lace. 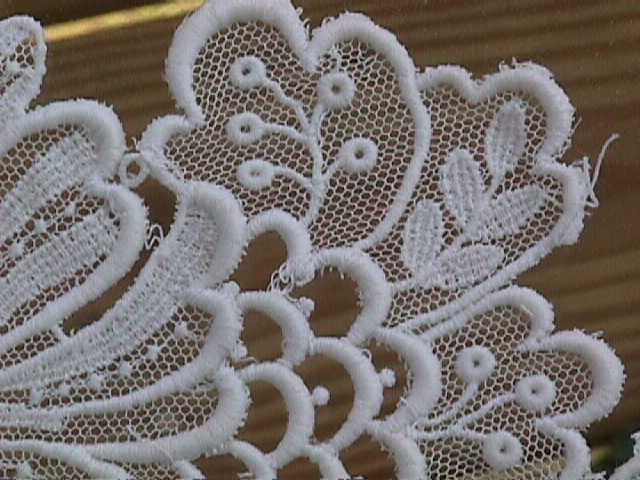 It includes Slovenian and Czech lace, but not Russian. (Am I surprised?) It won't exactly answer your question, but would give you an idea of regional differences. Have never seen anything like the first piece with double threaded point ground. Very interested in seeing other comments.